Rev. Calvin D. Kuder was born October 22, 1932 in Saginaw, Michigan to Armand C. and Mae (Carney) Kuder. 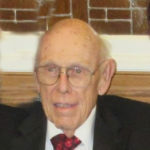 He passed away peacefully on Friday, March 15, 2019 at Lakeland Health Care Center in Elkhorn. Cal was raised in Bay City, Michigan. He was a proud alumni of University of Michigan where he received a bachelor’s degree in 1954. He earned a Masters of Divinity at Maywood Lutheran Seminary [now Lutheran School of Theology at Chicago] in 1958, and was ordained to the Ministry of Word and Sacrament that same year in one of the predecessor bodies of the Evangelical Lutheran Church in America. In 1983 he was awarded an honorary Doctor Divinity degree by Hamma School of Theology/ Wittenberg University (Springfield, Ohio). He was united in marriage to Joan Johnson Kuder on August 11, 1956. She preceded him in death [after 60 years of marriage!] on December 19, 2016. Cal served as called pastor at Redeemer Lutheran Church in Centralia, IL; worked at Fortress Press in Philadelphia; then again served as pastor of Saron Lutheran Church in Chicago, IL; of First English Lutheran Church in Tiffin, Ohio; and of Good Shepherd Lutheran Church in Southampton, PA. Upon their retirement in 1995, Cal and Joan relocated to Cedar Point Park in Williams Bay where they had owned a summer cottage for 30 years. They built their retirement home and welcomed friends and family for many visits. Cal was active in the Williams Bay Lutheran Church. He was a cantor, fill-in preacher and he helped write a history of the congregation. He also wrote a history of Cedar Point Park Association for its 75th anniversary celebration, and supported the Kishwauketoe Nature Conservancy, and the Walworth County Arts Council. He worked as a volunteer docent for Black Point Historic Estate on Lake Geneva. Rev. Kuder is survived by a son, David Kuder, of Urbana, IL; a daughter, Janice Kuder (Daniel Somers), of Iola, WI; a daughter, Martha Deckinger (Brian), of Bloomington, IL; a foster son, Dr. Lawrence Wierzbowski (Joy), of Bryn Mawr, PA, and five granddaughters: the “Ahh Girls” (Clarissa, Jenna, Rebecca, Hannah, and Sarah). The family will be receiving friends on Thursday, March 21, 2019 from 9:30 AM until the time of Service at 11:30 AM at Williams Bay Lutheran Church, 11 Collie St, Williams Bay, WI 53191. In lieu of flowers, the family requests that memorials be directed to Williams Bay Lutheran Church, P. O. Box 399, Williams Bay, WI 53191 or to the Parkinson’s Disease Foundation, 1359 Broadway, Suite 1509, New York, N. Y. 10018. In our 20 years of neighboring in Cedar Point Park, we will miss his kindness and sharing back and forth as good neighbors do. He made the best fudge and brownies ever! We enjoyed hearing his stories - he was the best ever story teller at Black Point! You have our deepest sympathy - so sorry we weren’t able to be with you. Will keep you in our prayers. Cal was an excellent storyteller and wonderful historian. His dedication to Black Point Estate was greatly appreciated by all those that knew him. Then there were those amazing brownies! The staff and volunteers from Black Point Estate send the Kuder family our condolences. Cal was a master storyteller and excellent historian. Not to mention, made the best brownies of all time. His dedication to Black Point Estate was inspiring and he will be missed. The staff and volunteers send their condolences to the entire Kuder family. The Pry family from Tiffin enjoys many great memories of Cal, Joan, and Kuder family. Christmas caroling from the church bus! Rest In Peace. I never had the honor of meeting your Father, Pastor Jan, but What I have heard he was a wonderful Man. Our thoughts and prayers are with you and your family. Ronald and Celeste Enoch.